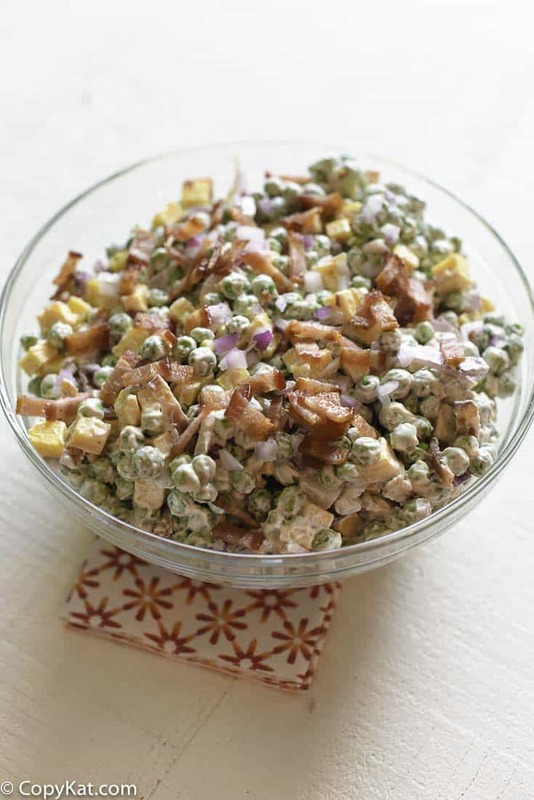 Homemade Pea Salad with Bacon is a summertime classic salad, but you can enjoy this pea salad with bacon any time of year. Homemade Pea Salad with Bacon is one of my favorite salads for the summer, it’s easy and quick to put together. Chances are you have many of these ingredients already in your pantry. Who doesn’t love a salad this is easy and quick to put together. The cubed American cheese is an addition that I just love. Luby’s Cafeteria cubes their American cheese when they put it in salads. Small cubes of cheese have a lot of flavors, and it looks so attractive as you can see the bits of cheese sprinkled through out the salad. Another special ingredient in here is smoked paprika. Smoked Paprika gives salads a great smokey flavor. You can use smoked paprika in steak rubs, or seasoned flour. Love this salad? You may enjoy these other salads that would be perfect for your next event. 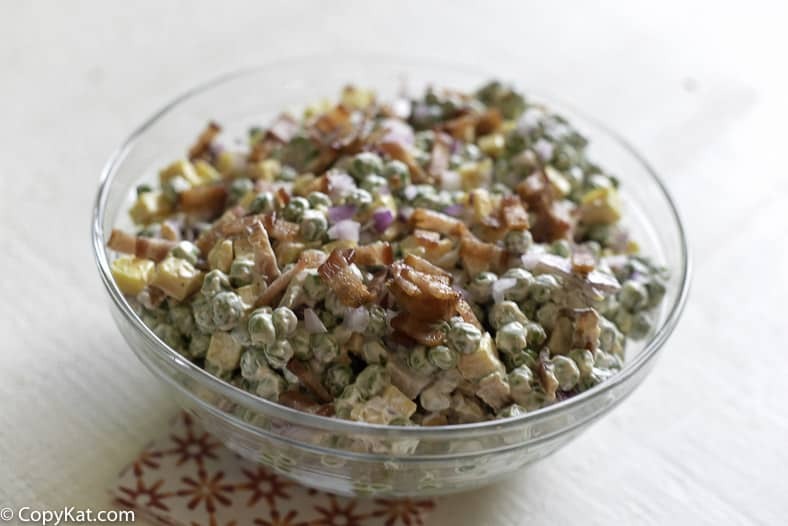 You will love this classic Pea Salad with Bacon. In a large bowl combine mayonnaise, salt, pepper, and smoked paprika. Stir well. Add to the seasoned mayonnaise, frozen peas, red onion, cheese, and bacon. Stir to combine. Let rest in your refrigerator in an air tight container for 2 hours before serving. This is best when left overnight before being served. D0 you have a pea salad w/eggs,green olives,relish,cheese, celery, and mayo & seasoning? Do you have a recipe for Anthony’s Home Port’s Almond Chicken Salads Dressing. I seem to have lost my Copycat recipe. Please email it to me at the email address below. I would appreciate it very much. Thank you. Do you have a recipe for the salad dressing for, Anthony’s Home Port ‘s ALMOND CHICKEN SALAD. I use to have it, but I misplaced it. Please email it to me . I would appreciate it very much. Thanks. I cannot wait to try this recipe! Thank you. Ok, I will add the peas to the recipe, they are frozen peas with nothing being done to them. I think you failed to add the peas in the recipe. Do you rinse or cook the peas any before adding them? Thanks!